Veteran TV host-comedian German Moreno, more popularly known as Kuya Germs, suffered a mild stroke on Friday. Kuya Germs, also called as the Master Showman for hosting the long-running late-night TV show “Walang Tulugan with the Master Showman” which airs every Saturday on GMA-7,” is currently confined at the Acute Stroke Care Unit of St. Luke’s Medical Center in Quezon City. 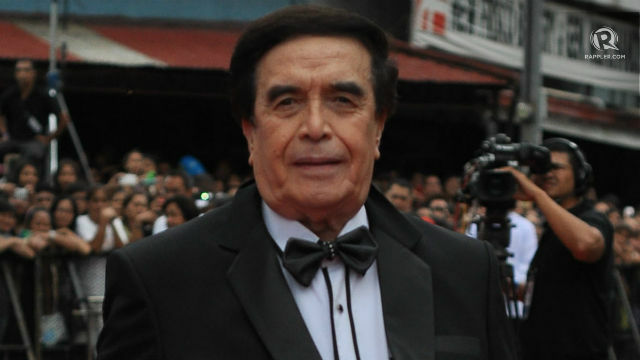 Kuya Germs was last seen in public during the “Dong-Yan wedding” on December 30 last year. In a Facebook message, Federico Moreno, Kuya Germs’ son, told Gorgy Gula, a Star Talk reporter and a Philippine Entertainment Portal contributor, the current condition of his father. “His right leg is at 50 percent mobility. Zero percent on his right arm and a bit slurry on his speech,” Federico told Gula. Federico assured that Kuya Germs is now okay but he cannot entertain calls or visitors at the moment. Still, he humbly asked the public for prayers for his father’s quick recovery. In a separate interview, one of Kuya Germs’ staff, Chuchi Falardo, said the Master Showman’s mild stroke resulted from over fatigue. The seventy-one-year-old Kuya Germs was last seen in public on December 30 last year during the wedding of Dingdong Dantes and Marian Rivera as one of the principal sponsors.